Written by David Jacoby, Esq. Reviewed by Mary Trotter, Esq. Recently, I had the opportunity to deal with the State of New Jersey Medicaid System. I quickly determined that although the Medicaid System for Long-Term Care in Florida has its difficulties and the Long-Term Care Planning techniques are ever dwindling in Florida, Florida still has many planning opportunities that are no longer available in the State of New Jersey. NO PERSONAL SERVICE CONTRACTS: New Jersey does not recognize Personal Service Contracts, wherein a Medicaid applicant can pay another individual (many times a family member) for coordinating their affairs. In many cases, the family member will utilize the monies paid for the benefit of the Medicaid applicant in the future. NO UNOCCUPIED HOMESTEAD PROPERTY EXCLUSION: New Jersey does not permit you to keep your homestead home unless there is a living spouse who is residing in the home or your are going to return to your home within the next six (6) months. In Florida, the Medicaid Office accepts the statement that the Medicaid applicant (or a representative’s statement on their behalf) intends to return to the home. This statement is taken on its face without further investigation as to the true possibility of the individual actually ever being able to return to there home. NO EXCLUDING RENTAL REAL PROPERTY AS INCOME SOURCES OF THE APPLICANT: New Jersey does not permit any residential rentals to count as income sources for the Medicaid applicant. New Jersey Medicaid does permit commercial rentals to count as an income source if the applicant’s equity interest is six (6) percent of the value of the property or less. Florida permits rental real property (both residential and commercial) to be maintained by a Medicaid applicant. The rentals are treated as an income source, provided they are receiving fair market value rent, and not as a countable asset. This is just an example of what types of changes in the Medicaid Law in Florida we can expect in the future. 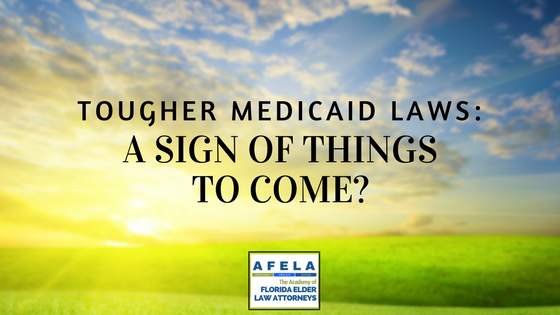 These anticipated changes make Medicaid Planning attorneys continually attempt to have their clients prepare for their Long-Term Care needs earlier and earlier. Since Medicaid Laws typically apply prospectively and not retroactively, the home of Medicaid Planning Attorneys is to have their clients “grandfather” into the current law, even if their need for assistance is not immanent. We are now definitely fighting a two-headed dragon; one head is the factual scenario surrounding the individual applicant, and the other head is the concern over the changing landscape of the Medicaid Laws in Florida.